The Liar Princess and the Blind Prince is, for the most part, a game that’s insultingly easy. That is, until it isn’t. Then it just becomes a bit frustrating. 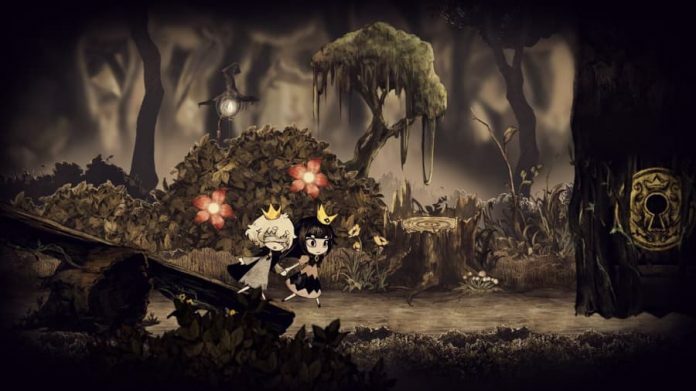 Presenting a fairytale-like scenario, The Liar Princess and the Blind Prince tasks players with taking control of the titular princess – who yes, happens to be a liar – in order to lead a blind prince. Where is she leading him? Through some woods to meet a witch, because she’d very much like him to be able to see again. Let’s rewind a little though, as the prince wasn’t always blind, and the princess wasn’t always a princess. Or a liar. Long story short, the princess is actually a wolf, the prince really loved the wolf’s singing voice, and, wanting to see who was behind the singing, the prince accidentally got blinded by the wolf. So, the wolf visits the witch and strikes a deal to restore the prince’s eyesight. But there are two caveats. One, the wolf has to give up her beautiful singing voice, and two, she has to bring the prince to the witch. Also, the wolf can now assume the form of a princess. Because otherwise, the prince just won’t trust her. And so with all that, the prince and princess’ journey begins. A journey that will take around four hours to complete, unless you get well and truly flummoxed at some point or another. And a journey that is more than a little heartwarming. The first thing that strikes you about The Liar Princess and the Blind Prince is that it looks absolutely wonderful. Both the characters and the world they inhabit look like doodles drawn in the blank book of an absent-minded artist – a little bit scrappy, but beautiful nonetheless. And as you progress through the forest to meet the witch, there are ample changes in scenery to keep your journey visually interesting. Only the limited animation of the princess when she’s in wolf form lets the game down a little. And like I say, only a little. The Liar Princess and the Blind Prince‘s soundtrack is generally a delight, too. Though perhaps a little repetitive. Each area you visit has its own theme, complementing the general ambience of your surroundings. Matching the story and the visuals, the music is fairytale-like yet also soothing. 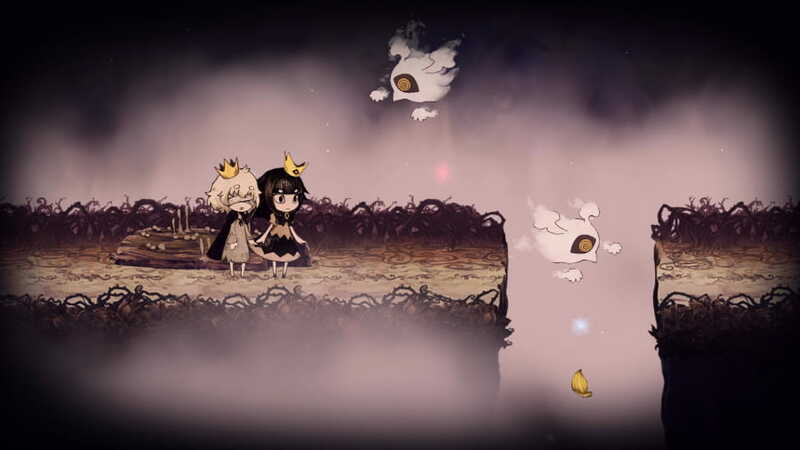 It matches the pace of The Liar Princess and the Blind Prince‘s gameplay, which is steady throughout. When it comes to other elements of sound design, however, such as sound effects, there’s nothing to write home about. And some players might find the lack of English dialogue disappointing considering that there isn’t a great deal of it. Though the Japanese voice acting is pretty nice to listen to anyway. Unfortunately, The Liar Princess and the Blind Prince‘s gameplay is the weakest aspect of the experience. With the prince being blind, you generally need to hold his hand as the princess to guide him. Then, when there are hostile creatures close by, it’s wise to release his hand, change into wolf form and then have at them. Combat is very simple. You just hammer one button to perform a combo, and as the wolf, very few enemies can actually harm you. Like the game’s combat, puzzles are also fairly straightforward. You’ll find yourself standing or placing objects on pressure-sensitive pads to activate moving platforms or open doors, for example, and… well, not much else. There’s one area in which things get a little more involved, with you needing to pay close attention to your environments for solutions to number puzzles, but that’s about it. 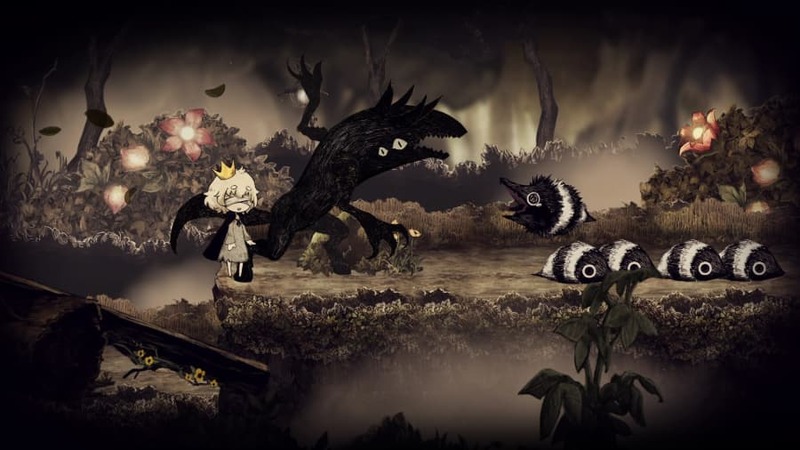 The Liar Princess and the Blind Prince is more of a platform game than anything. One in which you need to consider the abilities of both characters to proceed. It’s only as the game comes to a close that The Liar Princess and the Blind Prince starts actually presenting some sort of challenge. It won’t be that you won’t know what to do, though; the challenge comes in actually doing it. At points during your adventure with the prince you gain the ability to issue various commands to him, and you’ll have to make ample use of this ability to navigate the last level or two. It’s just a bit troublesome because of the delay between you issuing a command and him actually doing it. Also, he’s always a bit unsure when approaching ledges. The game’s usually spot-on checkpointing also seems to veer off as you reach the end of your adventure, possibly forcing you to repeat certain sections multiple times. It’s a shame that these frustrations appear so late in the game, as that’s when the narrative really starts to pay off. Just when you should be enjoying The Liar Princess and the Blind Prince the most, its gameplay begins to stand in your way. Though by then, most players will have invested enough into it to push on for the conclusion. 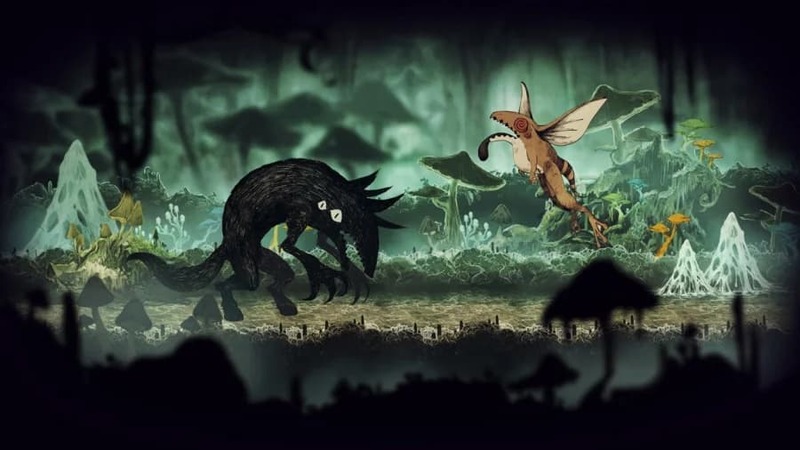 Ultimately then, The Liar Princess and the Blind Prince is a beautiful-looking game that tells a charming story, but its gameplay is just lacking. You’re likely to fly through it in less than five hours even if certain sections cause you trouble, and there’s little reason to go back – unless you want to pick up every last collectible for some unlockable artwork. I can’t deny that it warmed my heart after sitting through its credits, but my heart might’ve also sunk at that point if I’d have paid full price for it. The Liar Princess and the Blind Prince is available on PS4 and Switch. We reviewed the PS4 version.